Environmental assessment is conducted prior to development assessment to understand the potential impacts of a development and recommend conditions of development approval. In itself it is not an approval for works. Both the ACT and the Commonwealth have environmental assessment pathways which can apply to development on land in the ACT. If a proposal is listed under section 123 of the Planning and Development Act 2007 it is likely to need environmental assessment in the ACT planning framework. There are three environmental assessment options available for ACT protected matters: Environmental Impact Statement (EIS), EIS exemption and Environmental Significance Opinion (ESO). The suitability of each assessment process depends on the circumstances of a proposed development. The three ACT environmental assessment processes are summarised in the image below and explained further on each process' web page. Some proposals may involve Commonwealth protected matters if they are matters listed under the Commonwealth Environment Protection and Biodiversity Conservation Act 1999 (EPBC Act). If this is in addition to ACT protected matters, then a bilateral assessment approach can be taken. 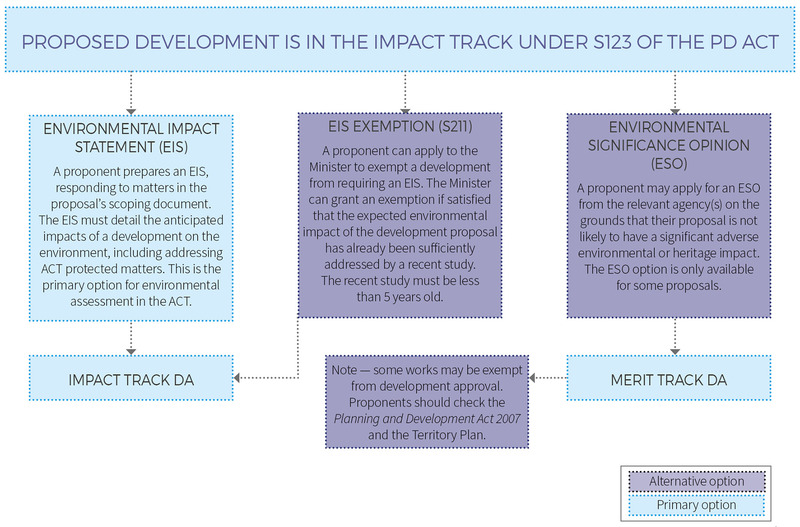 If no ACT protected matters are relevant, then the proposal can be assessed under the EPBC Act before seeking development approval from the ACT (where required). Process advice should be sought from EPSDD in relation to projects involving Commonwealth protected matters. Bilateral Agreement between the Commonwealth and the ACT for the assessment and approval of protected matters, also known as 'one-stop-shop' environmental approvals. To discuss the applicability of environmental assessment processes for your proposal, please email EPDImpact@act.gov.au.